Amazing location and breathtaking views! 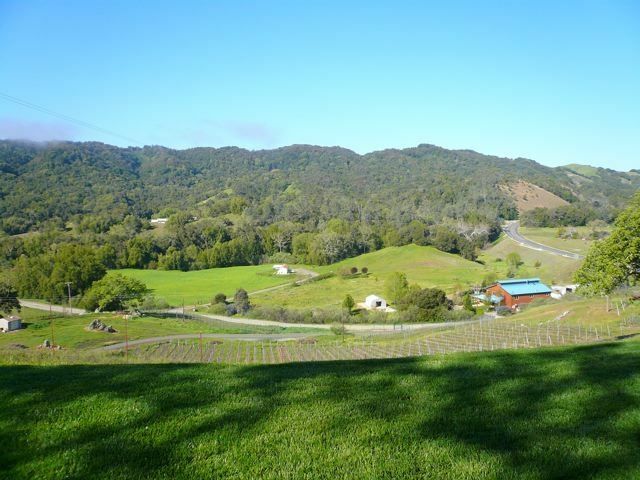 Nestled in the coastal foothills just off California Scenic Hwy 46 West - exactly halfway between the quaint artist village of Cambria (10 min) and gateway to the spectacular Paso Robles/Templeton wine region (just outside your door). Newly remodeled cottage from the ground up. Enjoy top of the line furnishings, amenities and touches that one would expect from a nationally renowned artist. The large master bedroom is a Southeast Asian retreat with unique pieces from Nepal and Thailand. The queen bedroom takes you back to early California. The kitchen is fully stocked and has granite countertops and stainless steel appliances. Relax with a cool beverage on the patio overlooking the vast farming valley below or tuck yourselves back in the shade of the oaks and bay trees off the rear patio. 100% privacy enables you to enjoy the massage table, read or watch the red tail hawks soar peacefully above. BBQ in your own "park" complete with picnic table and shade trees. Perched atop the Stromsoe Vineyard, a producing 5 acre vineyard of Pinot Noir and Pinot Grigio, you'll enjoy a country retreat setting. It's only 2 minutes to the first wine tasting opportunity on the "west side" in the York Mountain AVA. Our location is generally 15 degrees cooler than downtown Paso in the summer. You can visit dozens and dozens of fine wineries within a 10 mile radius. Be sure to take a sunset stroll on one of our uncrowded, pristine beaches less than 15 minutes from your door! Close proximity to downtown Paso, its wonderful restaurants and wine events - this location has it all! Please note: for the comfort of the majority of our guests this is a NON-SMOKING property. We moved from Los Angeles to the charming village of Cambria in 1979. We raised our daughter and son in Cambria until we found this slice of paradise on 25 acres just 13 minutes inland from the coast. We've enjoyed a large organic garden every year and we are currently looking forward to our 5th harvest of Pinor Noir and Pinot Grigio wine grapes from our 5 acre vineyard. We are artists by trade and find this location to be peaceful and inspiring. Two years ago we decided to remodel an existing cottage perched on the hill above our vineyard. The views are spectacular. We began offering the vineyard cottage as a nightly vacation rental in April of 2008. We've had many return guests ... everyone loves it! When we don't have rental guests, my husband and I like to lay on the grass and look up at the millions of stars. After a day of wine tasting and the warm ... sometimes TOO warm weather of Paso Robles, guests love to return to the cottage which is only minutes from the tasting rooms yet up to 15 degrees cooler. We enjoy the coastal influence on many hot summer days. We love to pack a sweatshirt and head to San Simeon Cove or Cayucos for a beach walk at low tide ... no crowds. The counties BEST restaurants are 15 minutes in any direction from the cottage! Paso Robles, Templeton, Cambria and Cayucos. New wall mounted flat screen in L.R. Bose docking station for iPod etc. beach towels, beach chairs, picnic supplies, maps to neighborhood wineries, massage table, yoga mats, binoculars/bird watching charts, high end beds and furnishings, DVD library, BOSE docking station for your iPod, iron/board, blow dryer, local artwork, local product honor bar i.e. local wine selection, olive oil, lavender, postcards. RATE QUOTES are for a single couple (1 bedroom). The 3rd and 4th person will be charged $10 per person per night due to our extreme drought conditions here in California. It is simply to help out with the additional water usage for sheets, towels, showers and dish washing. Please conserve where possible. Thanks!